Doktor A’s Copper Creeps line is expanding! Joining their big brothers and sisters, the new series consists of mini metal versions of The Bride and The Monster. Made of solid foundry cast metal, the mini Creeps are something special. At 1,75″ tall (4,5 cm), The Bride is a little bigger than The Monster who’s 1.25″ tall (around 3 cm). Each piece is lightly aged and polished. They come bagged and at only $10 (around £8) it’s a steal. I just love the material and all the little details on the figures are amazing. Pin collectors can also get their metal monster fix. Both The Bride and The Monster are turned into solid, polished metal pins aswell so you can take your metal monsters with you wherever you go. Each pin comes with its own card and costs $10 (around £8). 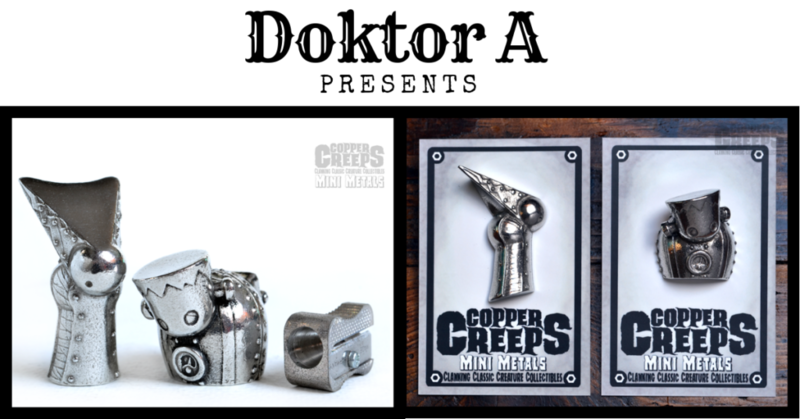 Launching at DesignerCon, you can get your mini metal Copper Creeps and matching pins at Doktor A’s booth (nr. 300) or online after the show.